09-Jan-2014 -- This DCP was the second out of the two we visited during an 8-day (4 - 11 January 2014) bike expedition from Maharashtra to Madhya Pradesh. The first visit was at 22N 75E. The quest for this DCP remains the most stupid and most tiring one till date: On 9 January 2014, we left from Omkareshwar around 14:00 hours. A heavy lunch and inadequate sleep for past few days was now taking a toll on us. This was when we committed a big mistake - relying on the Nexus 4’s navigation application than the GPS tracker’s compass navigation. As per the DCP site and even the application, the DCP was near Burūt. We crossed Sānāwad around 15:00 hours and headed on Sānāwad - Khandwa road and later took a diversion for Deshgaon as per the application’s directions. 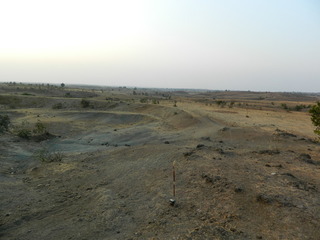 I was riding at the rear of our pack and while crossing Daundwa, the latitude had become 22°00.000' and I slowed down. I was searching for a right turn (to head westward) but couldn’t find one. I called up the team and asked them to halt and highlight the dilemma. We decided to continue on the course we decided, accordingly, we rode but around 10 km before Bhikangaon, the application gave up and started behaving erratically. We decided to start all over again but it was already 16:00 hours. After having a discussion with several locals, we took Bhikangaon - Sānāwad road for Burūt which was quite good. The DCP appeared near 1.5 km further (northwest) of Burūt. We hurriedly parked our bikes and started trampling across the fields. The latitude was almost achieved but the longitude was a hard nut to crack - we had to walk more than 3 km zig-zag to find our way across the fields. The farming villagers asked us what we were up to for which I had very meek answer because we had difficulties in understanding each other’s dialect! Finally, we descended a hillock and reached the DCP at 17:30 hours. No one had any strength left and the sunset was barely 30 min. away. We quickly took the necessary photographs. Thankfully, after walking for around 1 km, we came across several young men from the nearby village. I approached them and explained to them our predicament. They were more than happy to help us and showed us a direct way to the main road. It was during that chit-chat that I found that the DCP lies in the village of Mohali. But Ghodwa was another village adjoining Mohali. This is a peculiar case with the hinterland of India - every 1 km, the village changes and often, the borders are along the cultivated fields, making it difficult to demarcate it for the newcomers there! Around 18:40, we started rolling off to Sānāwad which was barely 40 km from there. Basically, we went on a wild goose chase to achieve the DCP which was very close to the point where we had started after lunch. Nevertheless, it was an enlightening and trying experience, a success of course!